This project's beginnings extend back in time to when I saw a copy of The Digger Papers in the summer of 1968. I carried that little compilation of Digger writings across the country to San Francisco, in search of the elusive group that was responsible for its inspiring vision. For years I played the peripatetic wanderer, hitch hiking from commune to commune, and ended up moving into the Sutter Street Commune, publishers of Kaliflower and the Free Print Shop, direct descendants of Digger dharma. There I started to collect the Communication Company papers and other Digger publications. Michael Horowitz, of the Fitz Hugh Ludlow Memorial Library (a massive collection of literature dedicated to exploring the many varieties of psychedelic experience), answered my Free Ad in one of the last issues of Kaliflower. He donated the two collections of Free City News that are scanned and presented herein. Thus began a continuing adventure to seek out all the bits and scraps of paper that the Diggers had published unto the world in a brief shining span of two years. To this day, I still am working on this collection. I'm not sure it's like the tale that the ancient mariner was compelled to impart to strangers but it has become a lifelong passion. 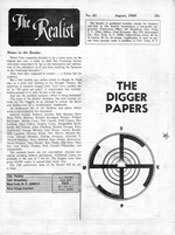 The last publication of the Diggers was the anthology of street news, manifestoes and articles titled The Digger Papers, August 1968. Co-published as an edition of The Realist, the Diggers distributed 40,000 Free copies.